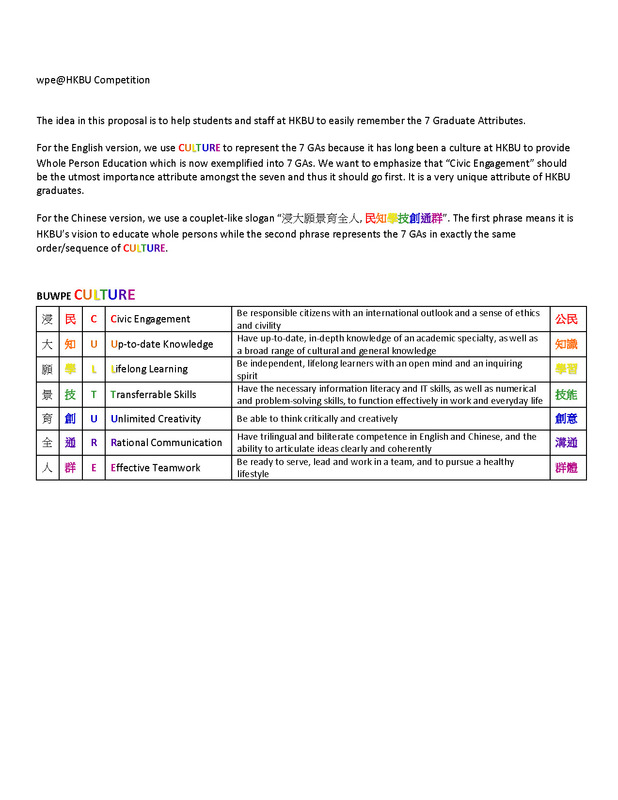 The idea in this proposal is to help students and staff at HKBU to easily remember the 7 Graduate Attributes. For the English version, we use CULTURE to represent the 7 GAs because it has long been a culture at HKBU to provide Whole Person Education which is now exemplified into 7 GAs. We want to emphasize that “Civic Engagement” should be the utmost importance attribute amongst the seven and thus it should go first. It is a very unique attribute of HKBU graduates. For the Chinese version, we use a couplet-like slogan “浸大願景育全人, 民知學技創通群”. The first phrase means it is HKBU’s vision to educate whole persons while the second phrase represents the 7 GAs in exactly the same order/sequence of CULTURE.